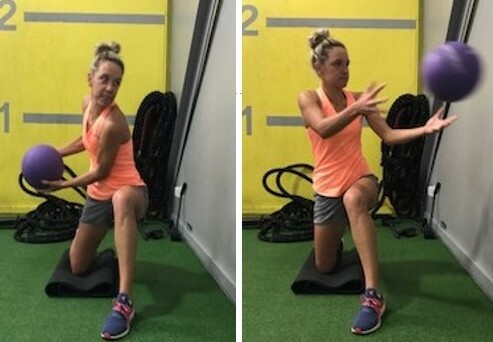 This exercise will challenge anti-rotation and anti-extension. Start with your feet on the floor and then advance them onto a box. Keeping your body in a straight line and elbows on the ball with your forearms resting on it. Imagine that you are stirring a pot with your elbow. Make sure that you keep your body in a straight line. Start in a side lying plank. Hold a weight above your head. When stable keep your arm straight and bring your arm down and through next to your waist. You will feel as if you are rotating. Make sure you keep your body in the neutral position. Switch sides. An AB wheel is required for this exercise. Hold the handle on either side of the wheel. Start on your knees. Then roll out as far as you can whilst keeping your back straight, your tummy must not touch the ground.Engage your core and return back to starting position again. This is a great exercise for a hockey player. Think of hitting a ball and the rotation you need to get maximum power in your shot. Hold a medicine ball and keep your right knee on the ground and your left knee bent. Then throw the medicine ball against the wall. It is important to get the rotation like your swing. Change sides as if you are hitting a toma ( Right knee up and left one kneeling on the ground). Hold onto a bar, slightly wider than shoulder width apart. Keep your body in a straight line. Squeeze your ABS and then swing your legs up. Lean back slightly while lifting both legs until your toes touch the bar. Your hips should do a lot of the work whilst your shoulders should barely move in the exercise. Hold yourself up onto a bar. Keeping your arms straight and your body in a straight line. Once stable lift your legs together without bending them, so that they are in line with your hips, Lower them back down to starting position. Do not let your legs swing. Hold yourself on a pull up bar. Once you feel secured, in one fluid motion, bring your knees and try and keep your legs straight. Move your legs in this position from left to right. Try and aim to get to 45 degrees on each side and once you are stronger aim to get to 180 degrees. Hold yourself in a plank position on a medicine ball. Once stable lift one of your hands off of the ball. Try and keep your body straight. Alternate your hands. 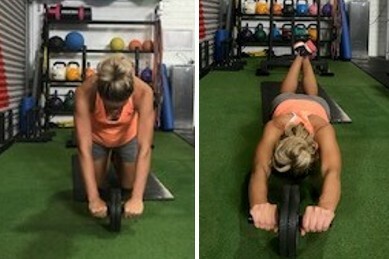 Get into a normal plank position, ask a friend to help put a weighted plate onto your back. Seesaw plank is a little dynamic back and forth movement. Shifting your feet into tip-toe and moving your upper arms forward. Then you move backwards again, stretching your calves. Adjust the pulley that it is on the lower lever as possible. Hold the handle as if you were holding a hockey stick. Step with your left leg as and follow with your hands as if you were hitting a forhand in hockey. Change sides and step off of your right foot as if you were hitting a toma.